NEW ORLEANS — After Hurricane Katrina destroyed his house and forced him to flee to nearby Baton Rouge, Ronald Williams spent a dozen years waiting for the right time to go home. Seven months ago, after repeated government promises that New Orleans was once again about as flood-proof as the city can get, Williams finally got up the nerve to return. But on Saturday, from the steps of his new rental home, Williams watched water again pour through the city's streets after a thunderstorm dropped as much as nine inches of rain in just four hours. 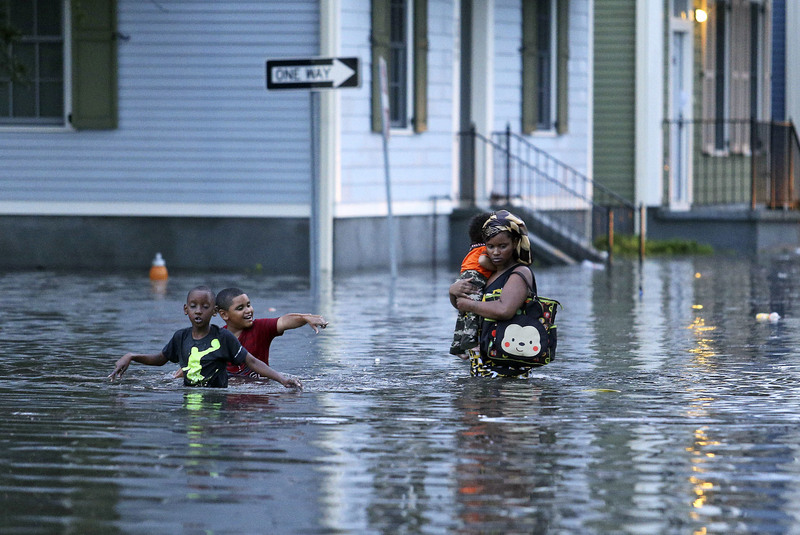 The ensuing flood overwhelmed the city's pump system and covered much of central New Orleans in several feet of water, taking 14 hours to drain and prompting 200 "life-threatening" emergency calls, according to city records. "I came home because I believed what they said about the new system and that it was supposed to be the best in the world," said Williams, 67. 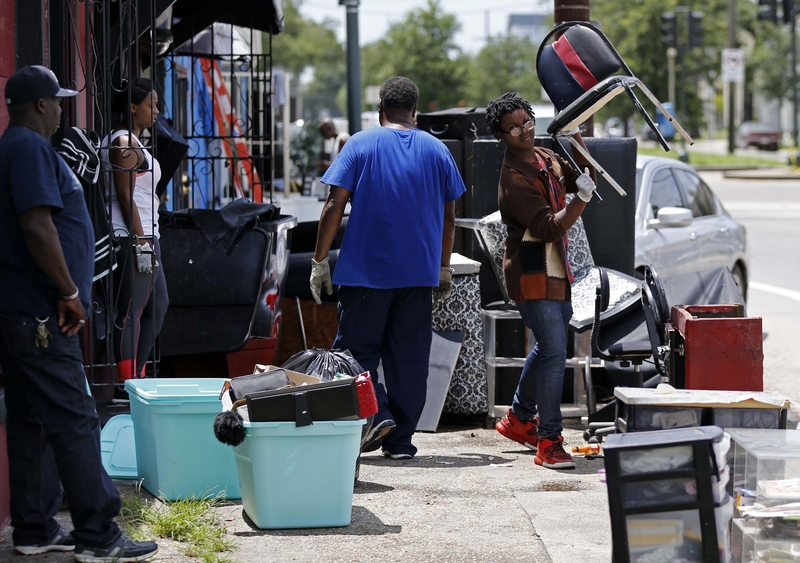 "But now it seems if we get hit by another Katrina, the city will be gone." 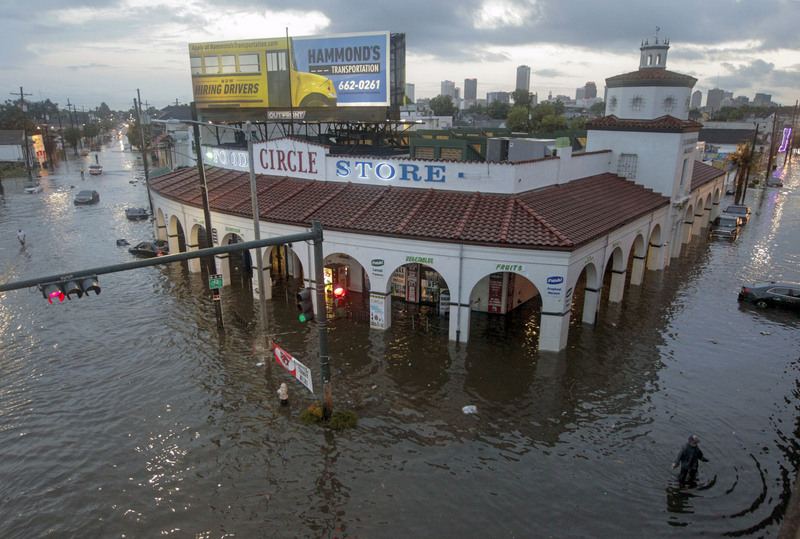 Panic and rough memories have surfaced across New Orleans this week as residents cope with yet another reminder that parts of the city sit as much as seven feet below sea level. And even though U.S. taxpayers have spent nearly $15 billion rebuilding the city's flood protections since 2005, few here are confident the fixes can keep the city dry for long. Unlike during Hurricane Katrina, the problem over the weekend wasn't the 133 miles of levees and flood walls that protect New Orleans from the tidal surges of the Gulf of Mexico or Lake Pontchartrain, which hangs over the northern and eastern edge of the city. Instead, parts of New Orleans were underwater because the city's hundreds of miles of drains and pumps couldn't bail rainwater fast enough. Though the water finally receded this week, the aftermath has thrown the New Orleans government and its municipal water and sewage authority into turmoil, reviving long-standing concerns that natural disasters here have been made worse by inconsistent leadership. The tension and recriminations come as the U.S. Army Corps of Engineers is preparing to turn over the newly built levee and storm barrier system to local officials, adding new responsibilities for a city already stressed by high crime rates and chronic budget deficits. But scientists and engineering experts say the weekend flooding is just another sign that neither money nor leadership will be enough to keep New Orleans above water forever as sea levels rise and the city's mushy soil sinks about two inches per year. "This is just another reminder of what we created there," said Robert Bea, a retired professor at the Center for Catastrophic Risk Management at the University of California at Berkeley. "It's been studied, the deficiencies have been identified but . . . we wait until something fails, and, at that point, we react quickly and try to reestablish functionality, and then back to business as usual." The past few days appear to validate some of Bea's concerns. On Sunday, amid streets clogged by scores of water-damaged vehicles, the leaders of the Sewerage & Water Board of New Orleans promised that all 121 drainage pumps were working properly during the storm. They said the flooding was simply caused by too much rain for the system to handle. By Tuesday, as community skepticism deepened, the board acknowledged that eight pumps were either broken or out of service for maintenance when the rain began. Power shortages also hampered pump operations in some neighborhoods. As a result, pumps in some hard-hit areas were operating at half of capacity, according to Joseph Becker, the water board's superintendent. In an uptown neighborhood, some of the flooding might also have been exacerbated by a Corps of Engineers project designed to limit future flooding. Contractors digging new drainage culverts left three 70-foot holes in metal panels that lead to the Peoples Avenue Canal, allowing water to back up into the neighborhood, said Col. Michael N. Clancy, commander of the corps' New Orleans district. But New Orleans residents are directing much of their anger at city officials, with some holding signs that read "Katrina" or "lies" at a packed city council hearing Tuesday. "For a lot of people, this is PTSD," said Hillary Barq, 24, ­referring to Katrina and using an acronym for post-traumatic stress disorder as she recounted how she spent Saturday night "floating through" her neighborhood trying to rescue stranded motorists. Cedric Grant, the executive director of the water board, apologized for his agency's missteps and announced at the hearing that he would retire after hurricane season. New Orleans Mayor Mitch Landrieu said Tuesday evening that he would push to fire Becker and the water board's communications director. The city's public works director also has resigned, Landrieu said. "The people of this city deserve to have all the facts." Landrieu said. "But we will never be able to pump our way out, or engineer our way out, from Mother Nature." 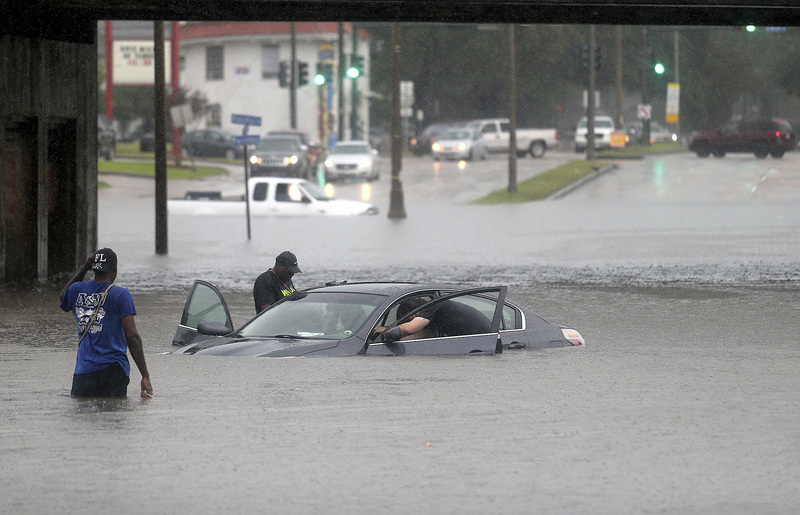 A thunderstorm dumped several inches of rain on the New Orleans area on Saturday, Aug. 5, causing flash flooding. New Orleans relies on 65,000 catch basins that collect water so it can be pumped into drainage canals. During Katrina, an 8- to 14-foot storm surge funneled into those canals, which resulted in six major levee breaches that flooded 80 percent of the city. The Corps of Engineers has since fortified the levee system to withstand a 100-year storm — roughly equivalent to a storm that has a 1 percent chance of occurring every year. The upgrades include three new retractable barriers and pumps that can separate the lake from critical canals. Before Katrina, many people in New Orleans feared rain more than they did the ocean. The recent storm confirmed those fears. Major freshwater flooding occurred here in 1978, 1983 and 1995, when nearly 20 inches of rain killed seven people and damaged 44,500 homes and businesses, according to the Times-Picayune newspaper. After that flood, and again after Katrina in August 2005, Congress authorized a total of $2 billion to enhance the city's drainage system. The money is in addition to the $14.5 billion in federal money spent on the new levee system. decade storm. The National Weather Service said Saturday's storm was a 50- to 100-year event. Becker and Clancy said developing an impenetrable defense to a storm of that magnitude would require tens of billions of dollars in additional investments. "If you are asking me to drain nine inches of rain, I need six times the pumping capacity, six times the drainage pumps and six times the canals," Becker told the council. "I don't need three or four more pumps, I need 400 or 500 more." And even if New Orleans could pump out that much water, the continual pumping process is causing the city to sink, said Ed Link, a civil and environmental engineering professor at the University of Maryland who led a task force that examined the city's flood protections after Katrina. He said that because the city's soil has high organic content, when it dries out, "it basically collapses." But New Orleans officials have more-immediate concerns. Residents say many storm drains and canals are too clogged with debris to be effective. At Tuesday's council meeting, public works officials said the city has only enough money to clear 68 of the 1,300 miles of canals this year. And starting next year, local agencies in New Orleans will have even more responsibility to shoulder. The Corps of Engineers is preparing to hand the newly constructed surge barriers over to the state. It will then be up to the water and sewer board to make sure the barriers and pumps are maintained and properly deployed when tropical weather threatens, Clancy said. "It's a state-of-the-art system that is going to be difficult for the locals to maintain and fund," Clancy said in an interview, noting that maintenance on the levee system costs the corps about $30 million a year. New Orleans residents know it's a matter of time before those flood defenses are also tested. 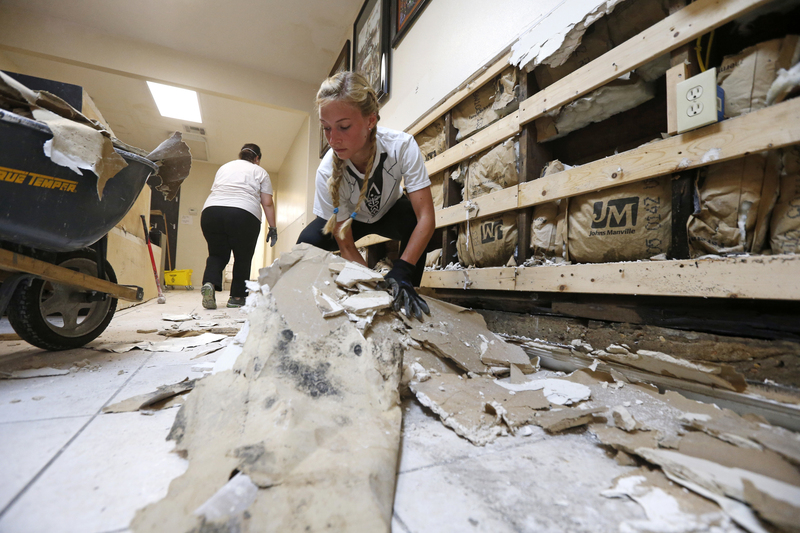 "There is nothing you can do," said Connie Brown, 61, as she swept up flood debris in front of her church. "It's like if you run water in your bathtub and it overflows — there is only so much you can do until it drains." Tim Craig is a national reporter on the America desk. He previously served as head of The Washington Post’s Afghanistan-Pakistan bureau, based in Islamabad and Kabul. He has also reported from Iraq, the District and Baltimore.